For Valentine's Day, you can choose from three different meals: Heart Shaped Stuffed Pasta with Short Ribs & Smoked Ricotta, Spice Lamp Chops with Beet & Carrot Farro or Hot & Sour Shredded Pork with Bok Choy, Mushrooms and Grits. You can also add appetizers and desserts like Fondue or Lava Cake. The majority of the ingredients are certified organic or certified naturally grown, with the meals taking anywhere from 10-40 minutes to prepare. I'm already starting to feel the love, aren't you? As V day is next week, you'll need to place your order for a holiday meal by midnight tonight, Feb 4. It can either be delivered to your door or be available for pick-up. 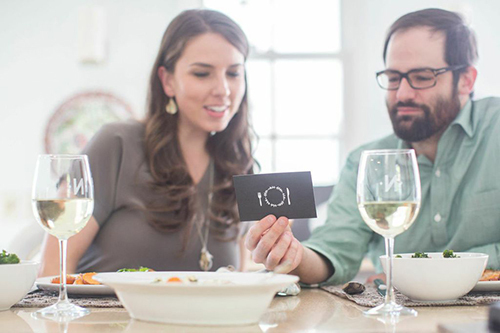 For some added fun, Garnish & Gather will be surprising five lucky couples dining at Empire State South in Atlanta on Valentine's Day. 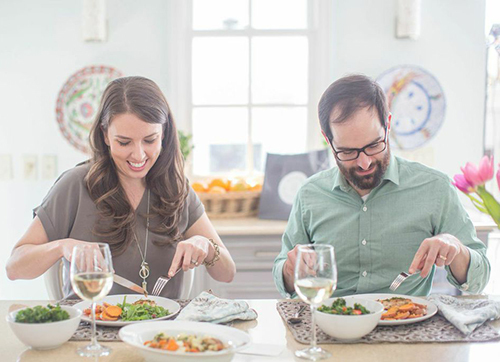 You'll have your entire dinner paid for, plus go home with a ready to cook dinner kit created by ESS's Executive Chef, Josh Hopkins. If you're not based in Atlanta, there are many excellent companies that provide a similar service closer to your locale. 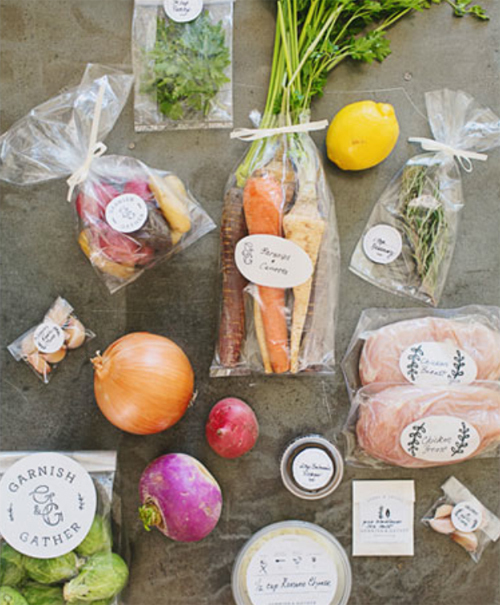 (google 'meal delivery' for your city) If, like me, you're smitten with this idea (and ATL based), peruse the entire Garnish & Gather kitchen, here. Hi! I'm Beth Lord of the indie-pendent. Pam kindly asked me to be a guest blogger here on Sweet Peach Blog and I couldn't be more excited! If you are already familiar with the indie-pendent, then you know that we are all about the handmade, the home and celebrating one's "indie"pendence. Our retail collection represents the finest artists and crafters throughout the USA. 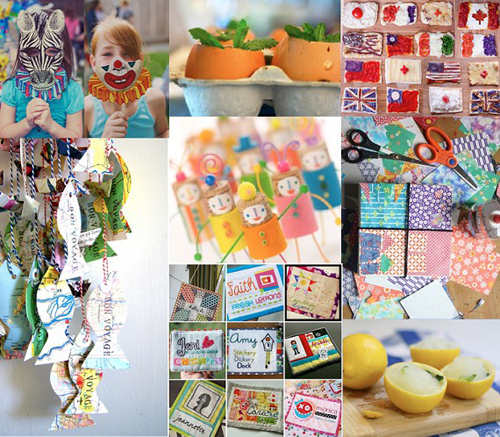 We host some pretty amazing handcrafted events, birthday parties, bridal and baby showers (if I may say so myself), and we hold some awesome workshops where kids and adults learn all sorts of skills and crafts that they can incorporate into their spaces and into their lives. I love sharing the unique products and creative ideas I uncover or that are graciously shared with me by others, but most of all, I love the stories behind it all and the amazing people I meet in the process. Today I want to share with you a new concept in mealtime provisions here in Atlanta...Garnish and Gather. In the fall of 2012, Emily Golub & Brenda Gage founded the company, "aimed at connecting more folks with wholesome, locally grown foods, teaching creative cooking techniques, and giving people their time bage- G&G makes dinner simple again." When Emily introduced me to the concept while inquiring about Belly General Store becoming one of the pick up locations in Atlanta, I could hardly wait to get my hands on one. (Belly is now the new home to the indie-pendent) Lask week I had the opportunity to try my very first meal and I have to say, it exceeded my every expectation. And did I mention the packaging?... so cute. 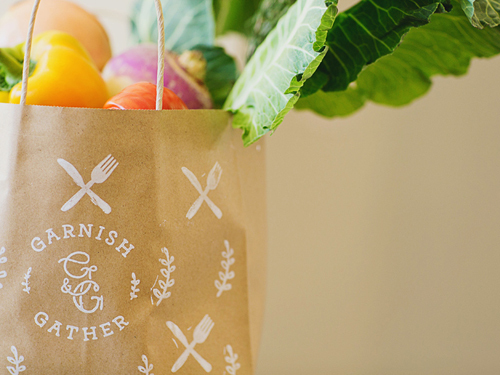 How often does unpacking your groceries bring a smile to your face? I am so glad Garnish and Gather selected Belly as one of their pick up locations...for me, it's kind of like having free delivery!